2. ‘________ Wires were in Vipanchiveena’, said Bharat? 3. In which vocal system, Bhasha- Vibhasha are placed? 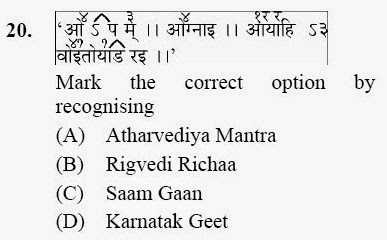 5. Who is the writer of ‘Shringarhar’? 6. Which one of the following artists is not a Sarod Player? 7. “Kan Gujari” singer is related to which state of India? 8. In which capacity, ‘Pancham’ is transferred from its own place in Madhyam Gram? 9. How many swaras are used by Pt. Lochan in his Ragas? 12. ‘Ektantri’ Veena was called by which name? 13. Who has composed ‘Raagkadamb’ musical composition? 15. Aamad is a technical terminology of which of the following art? 16. ‘Pramaan Shruti’ is placed on which Shruti? 17. Sitar has evolved from which of the following instruments? 18. Which one is the instrument without Sarika? 22. Which one is not mentioned in eight rasas of Bharat? 23. Which one is in right form of ‘Praman Shruti’? 26. Who was the inventor of Raag ‘Laajwanti’? 27. Which raga is composed with Komal Nishad in Shudh Nath? 28. Who was the inventor of Gramophone? 29. ‘Budhva Mangal’ music programme is related to which city? 31. Which artist has established Maihar Band? 33. How many Banis are in Dhrupad? 34. Which Raagas are mixed in Raag Jog? “Sa Ni dha Ni Ga Re, Sa Re, Ga, Ma, Pa” belongs to? 38. Assertion (A): Sahitya is of secondary importance in Absolute music. Reason (R): Sacred music belongs to the sphere of Absolute music. (A) (A) is true (R) is false. (B) Both (A) & (R) are true. (C) (R) is true (A) is false. 41. According to Tagore, which instrument is not appropriate for accompaniment with Rabindra Sangeet? 43. Which one is the biographical presentation of his life written by Rabindranath? 44. How many matras are in ‘Teora’ Tala? 45. Which one is the sign of ‘Som’ or 1stmatra of any Rabindrik Tala? 47. In which city, Ali Akbar College of Music is situated abroad? 48. Which percussion instrument is from Karnatic music? 49. In Natyashashtra, instrument is called by which name? 52. Bahadur Sen is related to which instrument? 53. Which one of the following is frequency of Shuddh Dhaivat of Western Shuddh Swar Saptak? 54. Who was the founder of ‘Chakrik- Prakriya’ for measurement of ‘Swar- Samvaad’? 55. Who was the inventor of “Shruti- DarpanVaadya”? 56. Which of the following is in correct order? 58. In which Puran the name of Kalpas are based on the notes on music? 67. How many Bharatratna for Sushir Vadya? 70. The music of Lochan’s period was based on which gram? 71. Which instrument was prepared by Helmhotz for recognizing the ‘Anshikas’ of Mishra Swara? 74. Who made the ‘Cyclic Theory’? Assertion (A): Art in India was independent of Religion. Reason (R): Temples have been repositories of Art in India. (A) (R) is false (A) is true. (C) (A) is false (R) is true. Assertion (A): Grama in the ancient times was evolved only to find new scales. Reason (R): Murchanas evolved from Jatis. (B) (R) is true (A) is false. 51. Shanta, Amar & Pramada are the characters of which Dance-Drama of Tagore? 52. Who composed the song ‘He Antaryami, Trahi....’? 53. Who was the editor of ‘National Paper’ magazine? 54. 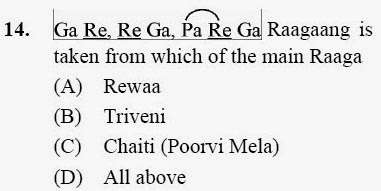 Which one is the correct divisional structure for Ada-Chartal used by Tagore for his songs? 57. ‘Nibira Ama Timir Hote’ song is based on which category? 58. The following song is based on which category? 59. The song ‘Tomar Khola Hawaye’ is based on which ‘Tala’? 60. Who also played veena along with singing from among the following artists? 61. How many divisions are in Sur Fak Tal? 62. How many ‘Fhak’ or ‘Khali’ is in Tibra Tal? 63. In accordance with the total number of matra, which ‘Rabindra Tala’ is similar to Hindustani tala ‘Rupak’? 64. How many songs were not composed by Tagore among the total 157 no. of songs in ‘Geetanjali’? 65. In the song ‘TomarAsime....’ which ‘Vivadi Swar’ is used to make this composition ‘Raga Bihag’? 67. Who received the title of ‘Rangraj’ & ‘Tanraj’? 68. ‘Ami Chanchal He’ song is based on which ‘Tala’? 70. How many divisions are in ‘Naba Taal’? 71. ‘Jat’ tal is divided into how many divisions? 72. ‘Ore Natan Yuger Bhore’ song was composed to celebrate which occasion? 73. ‘Aaji Subho Dine’ song is based on which ‘Tala’? 74. ‘Ei Udasi Howar Pathe’ song is based on which category? 75. ‘Aaji Praname Tomare’ song is based on which ‘Tala’? 51. Who among the following was a renowned artists, who was a good Tabla player? 52. 9/4 indicate which layakari? 53. On which beat 3rd Tali of Shikhartal is placed? 54. Which Rishi is associated with Pushkar Vadya? 56. Which one among the following is not the category of Jati? 57. Which is the shortest unit of Tal? 58. Who was the Guru of Karamat Khan? 59. Which is not a category of Tihai among the following? 60. By which tal Tappa Gayaki is accompanied? 61. How many beats are there in the ‘Navpanch’ tal of Rabindra Sangeet? 64. Which renowned tabla player was expired recently? 65. In which of the Gharanas, the playing of description of theka is performed? 66. Which Tala has different varieties? 67. From where, Kuad of Rudratala will start? 68. In which university, dept. of tabla or percussion, instrumental is not separate? 69. ‘Dhama’ the instrument like tabla is used in which state? 71. In which Tala, Farmaishee Chakkardar of Jhaptala will be played without any change? 72. In which Tala, playing is possible without any change of Kamali (minimum of seven circles) of teental? 73. Which Pakhawaj Player has resided in Kashi for a long run? 74. Which Mridanga player is renowned as eminent of Laya?